When it comes to your fire sprinklers, you rely on a well-maintained fire safety system to keep both your employees and business safe in case of emergencies. When it comes to your fire sprinklers, you rely on a well-maintained fire safety system to keep both your employees and business safe in case of emergencies. But it can be easy to forget about these systems until we need them the most. It’s important to have your fire safety system inspected and maintained routinely to avoid issues with your sprinklers. One of these issues is oxygen corrosion, which can cause leaks, damage your sprinkler system, and make it useless in an emergency. Here is our guide to oxygen corrosion issues in fire sprinklers. 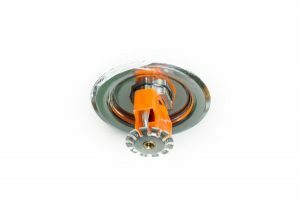 What Causes Corrosion in Fire Sprinklers? Oxygen corrosion is a natural chemical reaction that occurs when oxygen is exposed to steel pipes carrying water. For this reason, most water-carrying pipes will be protected and rust-proofed, but over time, corrosion can still occur. With higher exposure to oxygen, pipes are more likely to corrode, which is why the pipes of your sprinkler system should be inspected regularly. If there are issues with the compressors, acidic moisture can be introduced to your system, which can also cause corrosion. Oxygen corrosion can even occur in dry sprinkler systems if water is trapped in the system due to a leak or other damage. Oxygen corrosion causes two significant problems with fire sprinkler systems. First, the corrosion degrades the pipe over time, which eventually causes a leak. When there is a leak in your sprinkler system, you can lose water and risk the sprinklers not working in the event of an emergency. Additionally, corrosion can cause debris to build up in your sprinkler system. This can cause your system to become stopped up and prevent it from working in the event of a fire. Both of these problems can present a danger to you, your employees, and your business. When corrosion occurs in your fire sprinklers, dry nitrogen gas can be used to remove oxygen from the water in your sprinkler system. A fire safety systems professional will be able to use a technique known as DPNI, or “dry pipe nitrogen inerting,” to stop corrosion in your sprinkler system. To avoid an emergency or costly replacement of your sprinkler system, be sure to have the system regularly inspected so that it is in good working order. Whether you need smoke detectors, fire extinguishers, or an automatic sprinkler system installed at your commercial property, Fireline has you covered. We have been protecting people and property from fire damage since 1947—and our experience shows in our excellent work! We are known for our superb customer service, our expertise, and our reliability. For more information on how we can help your residential or commercial property, visit us online or give us a call at (800) 553-3405. We are located in Baltimore, MD, with a second office in Leesburg, VA. For more fire safety tips, be sure to follow us on Facebook, Twitter, and LinkedIn. This entry was posted on Thursday, March 28th, 2019 at 10:43 am. Both comments and pings are currently closed.